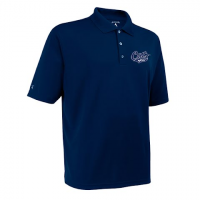 Show your Bobcat Pride in style with the Elevate Polo from Antigua featuring Desert Dry Xtra-Lite D2XL moisture management micro flat pique fabric with 3-button placket and a MSU Cats embroidered logo on the left chest. The Exceed from Antigua features Desert Dry Xtra-Lite D2XL moisture management micro flat pique fabric short sleeve polo with 3-button placket and a MSU Cats embroidered logo on the left chest. The Exceed from Antigua features Desert Dry Xtra-Lite D2XL moisture management micro flat pique fabric short sleeve polo with 3-button placket and a U of M Griz embroidered logo on the left chest. 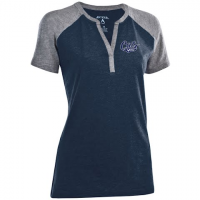 Show your Bobcat Pride in style with the Shine Short Sleeve Top from Antigua featuring comfortable cotton jersey fabric with contrast sleeves and MSU Cats embroidery on left chest. 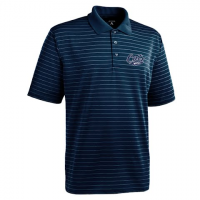 Show your Bobcat Pride in style with the Spark Polo from Antigua featuring comfortable cotton jersey fabric with 6-button placket polo constuction and MSU Cats embroidery on left chest. 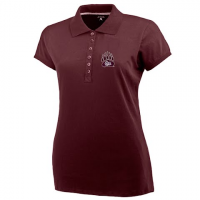 Show your Grizzly Pride in style with the Spark Polo from Antigua featuring comfortable cotton jersey fabric with 6-button placket polo constuction and U of M Griz Paw embroidery on left chest. 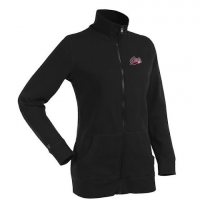 Show your University of Montana Grizzly Pride with the Revolution Full Zip featuring U of M Griz logo embroidered on the front left chest.